For years, Inga Creations’ warm-up suits and skating apparel were the staple of every young female skater. Some coaches dressed their students in the same style and color of “Ingas” to identify their rink and club. Inga Schilling, frustrated that her students did not have proper warm-up suits, began knitting them in 1970. The demand was so great that by 1971 she went into full time production. Her determination to succeed started in Germany where her childhood and teenage years were spent in a dance studio training to be a classical ballerina. She was exposed to theatrical skating at age 19 when she followed an aunt who was performing in the Eisballett Baier starring Maxi and Ernst Baier, 1936 Olympic pair champions. Schilling joined the show as a spotlight operator. Her stumbling, yet graceful, attempts to skate were noticed by Willi Schilling, a performer in the show, who became not only her teacher but eventually her skating partner and husband. Her first professional skating appearance was in the Olympia Ice Review. After a short partnership with Felix Kasper she was reunited with Willi Schilling. 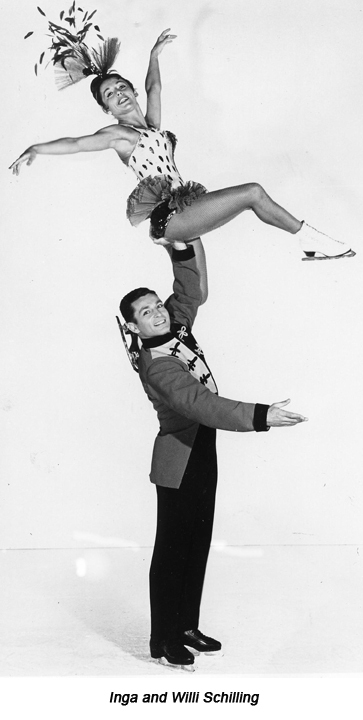 Before leaving Europe the Schillings had skated at the Casa Carioca, the Vienna Show, and made guest appearances in European movies. One of her outstanding memories was skating in Moscow with the Vienna Ice Show. Former Soviet leader Nikita S. Khrushchev came to see the show. She recalled the enthusiastic cheers of the Moscow audience. The Schillings moved to the U.S. in 1962 and joined Shipstads & Johnson’s Ice Follies. When asked if life on the road with a U.S. show differed from her European experience, Schilling volunteered she found it much more organized but equally exciting. In Europe, she and Willi traveled in their own car. Skating with Ice Follies, they traveled by train. A memory that remains is one of a costume problem. In 1968 she left Ice Follies and her husband for Los Angeles. Frank Carroll and Tom Lawler, friends from Ice Follies days, invited her to work with their students teaching grace and style at the Van Nuys Iceland. Schilling’s dance and ballet training was put to good use. One of Carroll’s students was future World Champion Linda Fratianne. “As my skating partner,” she replied. Lawler agreed although adagio was not something he had done. However as a former student of Maribel Vinson Owen he had skated pairs with her daughter (and namesake) Maribel. With this as a foundation he rapidly learned the necessary adagio moves. 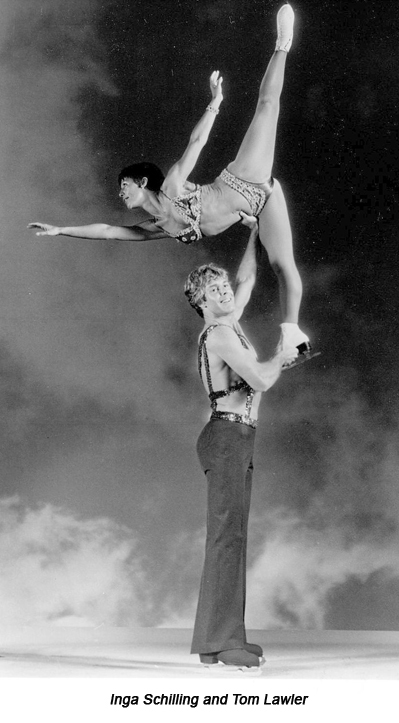 In September 1974 both Schilling and Lawler left their students behind and went to Sydney for three months where they debuted as skating partners. They were encouraged to enter the World Professional Championship in Jaca Spain in 1975. Schilling’s performance surpassed that of skaters twenty years her junior, and she and Lawler proudly won the Bronze Medal. Schilling’s life was busy with teaching, designing, and manufacturing Inga Creations, and periodic performances with Lawler. Their 1977 guest appearance on the popular TV show Charlie’s Angels marked the end of their skating career. A trip to Mexico introduced her to Bart Varelmann, the owner of the hotel where she was vacationing. They married in 1985 and continued to manage the hotel as well as a home in the U.S. The pressure of trying to run Inga Creations from Mexico led to Schilling’s decision to close the business. Now retired from the hotel business, they make their home in Florida. In 2009, at the age of 76, the energetic Schilling is teaching Yoga, skis, travels, regularly works out at the gym, and has the posture, grace, and verve of a young woman.